The Belarusian State Museum of the Great Patriotic War is the largest depository of historical documents and relics of 1941-1945. On June 2, 1942 the Central Committee of the Communist Party of Belarus had created the Commission responsible of collecting materials evidence of the courage and heroism of the Belarusian people in the Great Patriotic War. The Commission members managed to collect together unique homemade weapons, documents, photographs, uniforms, newspapers and magazines published underground, trophies as well as personal things of solders. Wide collection of unique drawings and paintings includes rare works by professional artists and amateurs, ordinary soldiers, who tried to reflect the horrors of war in their drafts. 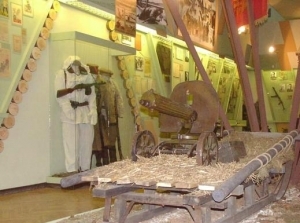 The first collected materials were exhibited in Moscow in the Sate Historical Museum in November 1942. Then the exhibition called «Belarus Alive Belarus Fighting» was brought back to Minsk. For some decades, this museum was the first and only museum on the territory of the former USSR that dealt with the Great Patriotic War. Since 1966, the museum is located in a tailor-made building in the center of Minsk. Today its holding counts in total more than 137,000 exhibits and some auxiliary material. The museum's collection increases one thousand specimens annually.